Sometimes good stuff happens because of mistakes. 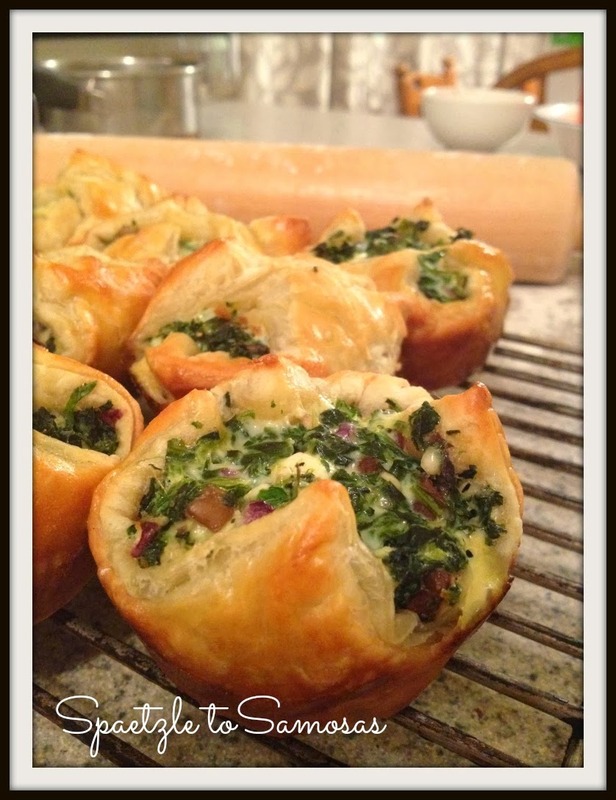 Like these Spinach puffs. I had bought the wrong frozen spinach and couldn't figure out what to do with it. And then I thought of Spanakopita, the lovely Greek mezze which tastes so very good. And because it has so much spinach you could almost convince yourself that it's actually good for you. From that the thought evolved. Let's see, I had spinach, mushrooms, and puff pastry. Something could surely be made with that. And oh dear did it taste wonderful. So very yummy. Healthy? I wouldn't go that far, but with all that spinach, something is good about it, surely. 1 sheet of refrigerator thawed puff pastry. Thaw the frozen chopped spinach and squeeze as dry as you can. Put in a bowl. Heat oven to 400F. Sauté the chopped mushrooms in some evoo and set aside to cool. Roll out the dough and cut into 9-12 squares. Place the squares into prepared muffin tins making sure there is enough to cover the top a little bit after being filled with the spinach mix. Combine all remaining ingredients in a bowl with ONE of the eggs (slightly beaten) and stir to mix thoroughly. Divide the mixture among the pastry lined muffin tins. Fold over the corners of the pastry squares and paint the tops with the remaining egg beaten with 1 tbsp very cold water. Bake in the preheated oven for 20-25 minutes. Serve hot. This recipe is one of those which could easily be customized. Exchange the mushrooms for roasted pine or walnuts, or even bacon.